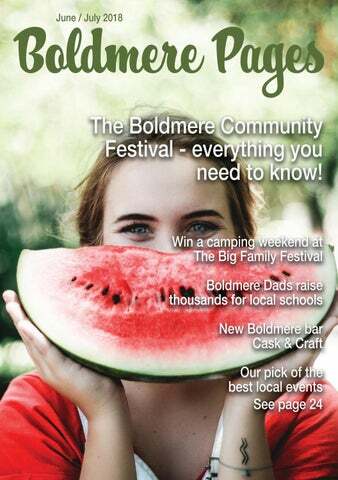 Welcome to the June/July issue of the Boldmere Pages, packed full of local festivals and events to keep all the family entertained this summer. 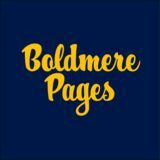 Catch up on the latest Boldmere news, find out everything you need to know about the Boldmere Community Festival and see our pick of the best things to do locally in What’s On. Don’t forget to enter our competition to win the biggest prize so far - a family camping weekend at The Big Family Festival! The Boldmere Community Festival, sponsored by Angels Day Nursery, is on Sunday 17th June 2-8pm and here is everything you need to know. The excitement is building as there are a number of new elements to the Festival this year including the Los Banditos Dance Zone where community dance groups will be performing throughout the day. There’s also an acoustic stage at the Boldmere Tap and two children’s zones featuring rides, stalls and other activities for kids! On the ‘Angels Day Nursery’ Main Stage, there is a fantastic line up of acts with an array of genres including rock, soul, funk, bhangra, folk, pop and disco! Highlights include Stone Cross, a hard hitting rock trio, Chris Whiting, one of the Midlands’ leading singer/songwriters, Ben Drummond, Boldmere’s own award winning singer/songwriter, and The Groove Exchange, seven musicians from around Birmingham who are on a mission to entertain! The Boldmere Community Festival is also proud to be supporting emerging local talent on ‘The Band Hub Presents’ Stage outside The Lounge where a great selection of new artists will get their chance to shine. The Band Hub is a music production studio based in Sutton Coldfield which supports and nurture new local talent. The Sutton Coldfield Community Games will return for its sixth year running and take place from 12 - 5pm on Saturday 7th and Sunday 8th July at Wyndley Leisure Centre. The easiest way to describe the Sutton Games is ‘a village fete combined with a schools sports day’. Run by volunteers and with all the activities provided free of charge by local sports clubs, groups and associations, the Sutton Games is a true community event with a simple aim: to give everyone, whether young or old, an opportunity to try their hand at the enormous variety of sports played and activities enjoyed in and around Sutton Coldfield. The weekend is designed to be completely interactive – visitors can try over 70 activities from athletics to agility games, bowls to Boccia, dance to dodgeball, sailing to skating, tennis to trampolining… all completely free of charge and without any commitment. The whole event is made possible by the generosity of the Sutton Coldfield Charitable Trust and six local businesses: Green & Co, WAA Chosen, The Kick Start Academy, Porsche Centre Sutton Coldfield, the Fairfax Multi Academy Trust and Sutton Spas. For more information about the Sutton Games and to see the full range of activities taking place throughout the weekend visit www.suttongames.co.uk. WIN A CAMPING WEEKEND AT THE BIG FAMILY FESTIVAL The Big Family Festival, sponsored by Bathroom Takeaway, returns to Dunton Hall in Sutton Coldfield from 27th-29th July 2018, for what is set to be its best year yet! Sooty, Rastamouse, Sid Sloane and Pip Ahoy are just some of the many talented performers on stage. Creative workshops with the likes of Aardman animations, a cinema, fun fair, sports, and lots of surprises are sure to keep all ages happy throughout the weekend. Entertainment includes finalists from TV’s Britain’s Got Talent and The Voice, as well as fabulous tribute acts to Ed Sheeran, Lady Gaga, Bob Marley and Ellie Golding. In addition there will be magicians, Bollywood dancers and theatre performances of Angelina Ballerina and Peter Pan from entertainment partner Stagecoach Performing Arts of Sutton Coldfield. Macmillan Children’s Books are sponsoring the Den, where a host of activities will be taking place. Perhaps you will find out “What the Ladybird Heard!”, encounter the Gruffalo or attend Slime school. The Outdoor Cinema, sponsored by Bobby’s Foods, will see a variety of workshops and performances or you can snuggle down on picnic blankets and bales of hay for screenings of Coco, Trolls and Sing-a-long with The Greatest Showman (top hats and tails are not essential but encouraged). This issue we have teamed up with The Big Family Festival to offer one lucky family (2 adults, 2 children) 3 day camping and event tickets worth £243. For your chance to win, send an email with your contact details to boldmerepages@outlook.com, no later than Friday 13th July 2018. Sizzling Summer Season ﬁ ﬁ new summer season which runs until September 2018 and is packed full of variety with something for everyone. After the success of the theatre’s two critically acclaimed community musicals, the Lichfield Garrick has announced it’s 2018 offering; Once Upon a Mattress. If you thought you knew the story of Hans Christian Andersen’s ‘The Princess and the Pea’, you might be in for a big surprise. This musical is full of side-splitting moments in this raucous and rollicking spin on the classic tale of royal courtship and comeuppance. Read the June-July 2018 issue of the Boldmere Pages, Boldmere's favourite magazine!